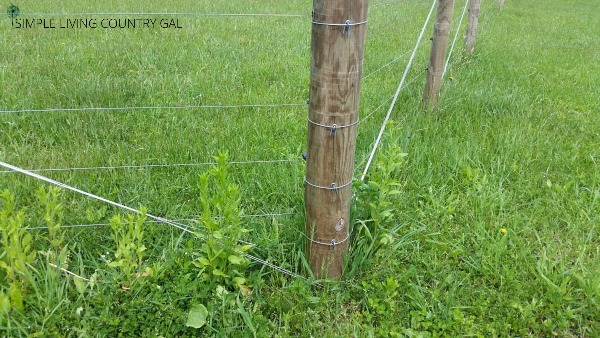 This post is about trimming the fence line – goat fencing 101. There is nothing more lovely than getting a phone call from a neighbor letting you know your buck is out again. This tends to happen every spring for some reason. If you have a homestead I am sure you completely understand. So after the 3rd call regarding our roaming buck who swears the grass really IS greener on the other side of his fence, I knew it was time for a fence inspection to find out just what was up. When you have livestock on your homestead this is an important chore that simply should not ever be overlooked. We had no idea how important this chore was until we began having goat buck escaping issues. Fence inspection is just exactly what it sounds like. You take a few minutes every few weeks or month to walk your entire fence line inspecting it for holes, breaks, or other interference. That day when Hubs and I did our very first fence inspection we found not one but several breaks in our fence causing the current to be weak and in some spots completely nonexistentt! The biggest culprit we found was the grass and how much it had grown up. It was actually higher than the fence and because of that caused some pretty major interruptions. Now, each month we make a point to mow down and trim all the grass around the fence line do a quality fence inspection at the same time. This may sound like an obvious and even simple task, but when I first started out I did not realize 2 major things. 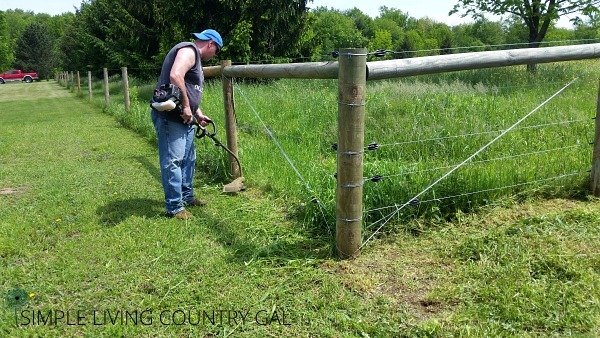 #1 If you do not trim the grass around the base of your electric fence, it grounds out and will be completely useless keeping anything in a pasture let alone a determined 180-pound buck. #2 Trimming a fence line especially when you have quite a bit of fence, is at least a day-long task. My advice? Enlist some help. Finally, yesterday hubs and I tackled this job and like anything else we do now on our little farm, (and much to the dread of my family) I snapped lots of pics for my new homesteaders out there. So, let’s get another handy dandy how to list ready to help make this big job a bit easier to do. Step #1 If you use electric netting fence like we do, the first task is moving the fence or taking it down altogether. Hubs and I just moved it out a few feet since we were keeping the fence line the same. One of the perks of netting is you can move it quickly and quite easily. 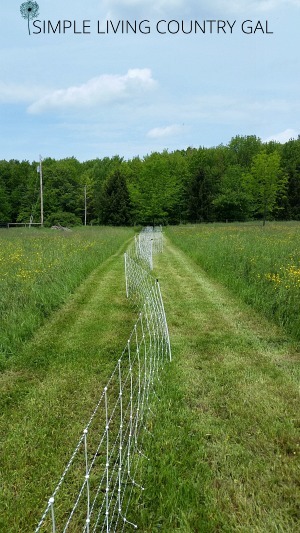 Pasture rotation is a breeze with this fence and I encourage you to check it out. It is from Premier One but you can find the same fence at the same price from Amazon. I love this fence so much I now have 4 of them including one for my chickens. Poultry netting is the only thing I have found that will safely keep my chickens inside where they belong. Ha, no more eggs in the goat’s hay feeders! 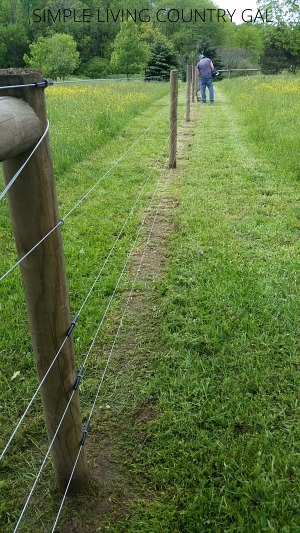 Step #2 Mow a good 5-10 foot ease way along the path of your electric fence, take it down as low as you can go. I used to fight Hubs on this, complaining that we were mowing down perfectly good grass that our goats could be eating. I soon realized that this was a good thing. When the pasture gets really tall the goats would much rather walk the ease way than roam through the tall field grass to their favorite spots. 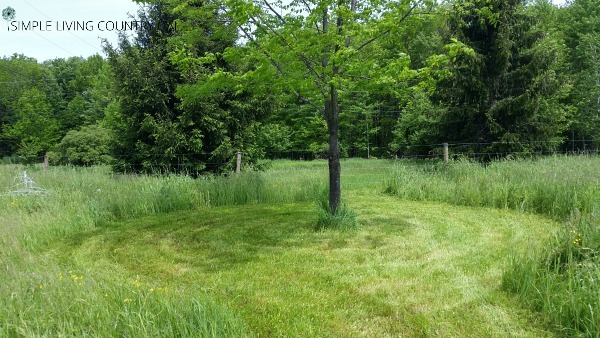 I now even go so far as to mow a border around our shade trees and a few paths through the pasture.The paths are perfect for my goat kids, they tend to get lost rather quickly in the tall grass so the paths help them stay closer to the herd. Step #3 Mow this grass LOW. Remember the lower it is the less you will have to do it. We take it down as low as our mower deck will go. Step #4 Put the fence back up. As you are putting your fence back up, take the time to check the condition of your netting as you go. This is a really good habit to get into. I always try to stay one step ahead of my goats, if there is a tear I would rather find it myself than have them make me aware of it by getting out and into the neighbor’s garden. Let me just jump in here quick to say, if you are brand new to homesteading and just thinking about getting animals this may all be alien to you. 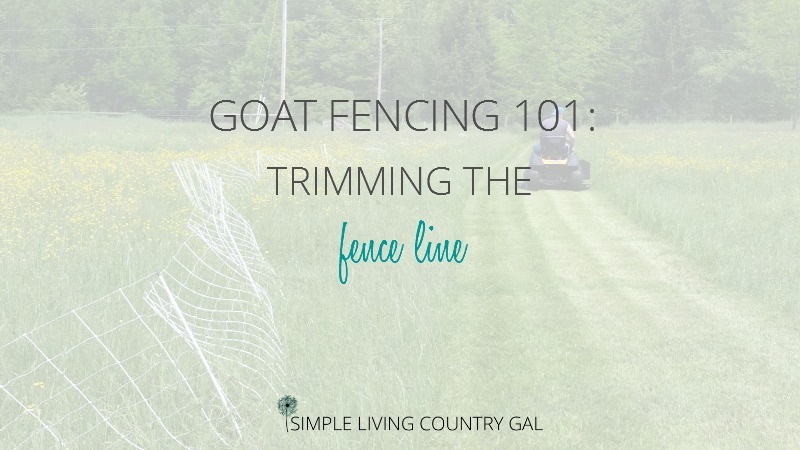 Read my post on Goat Fencing 101 to learn the different types of fencing and the pros and cons of each. Step #1 Mow down what you can reach. This is the easiest way to get rid of most of the grass and weeds, but be careful. 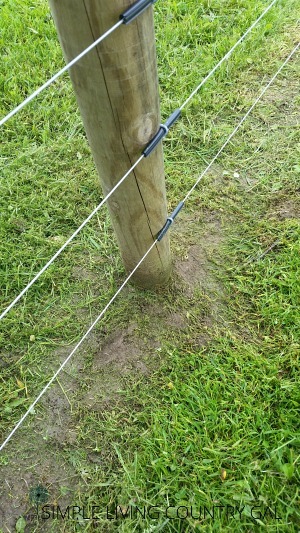 We have done damage to our lower wire by not paying attention. Also, it is better to mow the border from both sides. Again it’s the ease way thing. You are giving a nice path for your goats and yourself if you ever need to go out and reach your herd for any reason. Step #2 Weed wack to the dirt. Hubs like to weed whack everything down completely to the ground. The reason we do this is so that this job doesn’t need to be done nearly as often. This is the most time-consuming part. Do it right so you need to do it less. Step #3 Check the condition of your fence. Again it is good to stay on top of things on a homestead. Find issues and correct them before they become full-blown problems. That’s it, kids! I know this is an obvious chore that needs to be done and it may be common sense to some of you as to how to do it. But to be honest, this city girl did not have a clue in the beginning! It can be easy to overlook the obvious and before you know it you have a huge problem on your hands. 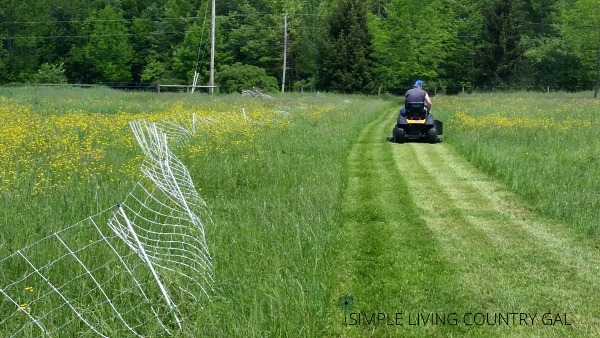 Get fence line trimming on your monthly to-do list so it is a task and not a day-long chore.